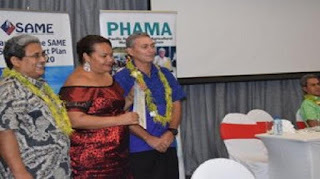 The Samoa Association of Manufacturers and Exporters (SAME) will be leading a delegation of four company members to Pasifika Festival in Auckland on 25-26 March. The four companies were invited to Pasifika Festival 2017 under the Pacific Islands Trade & Invest (PT&I) NZ Path 2 Market programme alongside 28 companies from eight Pacific Island countries which are also part of the delegation. PT&I NZ is tasked to help Pacific Island countries export to New Zealand and has worked very successfully with SAME for many years on programmes and projects aimed at increasing exports from Samoa. The Samoan companies represent a wide spectrum of products ranging from turmeric and coconut jam to garments and handicrafts from the local garment sector. The delegation will be led by Tagaloa Eddie Wilson, President of the Samoa Association of Manufacturers & Exporters (SAME). Tagaloa is also the Managing Director of Wilex Samoa which has successfully launched the Koko Loa chocolate products range. The delegation includes E-Life, a manufacturer of a range of turmeric products. The company is owned by Etu Tuala and his wife Elena and turmeric products are growing in importance as a health drink supplement. It is said to hold many properties that can contribute to relief of symptoms associated with joint pain. It is understood there is a growing market in New Zealand for turmeric-based products. Another company, Heavenly Water has been a successful producer of a range of purified bottled water but more recently, a coconut Jam range that is being supplied to many of the hotel and tourist locations in Samoa. Coconut products have been an especially popular choice of tourists visiting Samoa and looking for something distinctly Samoan. Heavenly Water is a family owned business by Vickie Vaai and her partner Jerome. A big plus for the company is its HACCP (Hazard analysis and critical control points) certification, an international certification programme aimed at reducing potential hazards for companies processing food based products. For many international markets, HACCP is required before products can be imported into the country. Mamanu Samoa Design is a Samoan based co-operative made up of a group of Samoan garment and handicraft operators. The cooperative has been successfully marketing the products in Hawaii and very successfully at the Guam Cultural Festival held in 2015. “Samoan garments are held in high regard internationally for their distinctive design and fabrics,” Colin Stringer from SAME said. Le Vai, the fourth company, is an old family owned Samoan business traditionally producing a variety of bottled water products. More recently it has broadened its product range to produce a fish pate made from a local delicacy called Palolo. Palolo are fish that are unique to Samoa and can only be harvested twice a year when they rise to the surface of the sea. At the time of the palolo rising, as it is known locally, many Samoan families can be seen with their various utensils finding ways to catch their share of this rare delicacy. The delegation brings a range of products with niche market opportunities to test on this trade mission. “We look forward to welcoming the delegation and delivering a programme that develops their path to the New Zealand market,” PT&I Trade Development Manager Joe Fuavao said. Photo credit: Emile Adams Vicki Vaai Owner of Heavenly Water, which will feature at Pasifika, being presented with HACCP Certificate alongside Tagaloa Eddie Wilson Leader of delegation to Auckland and NZ Deputy High Commissioner Mike Walsh in December 2016.